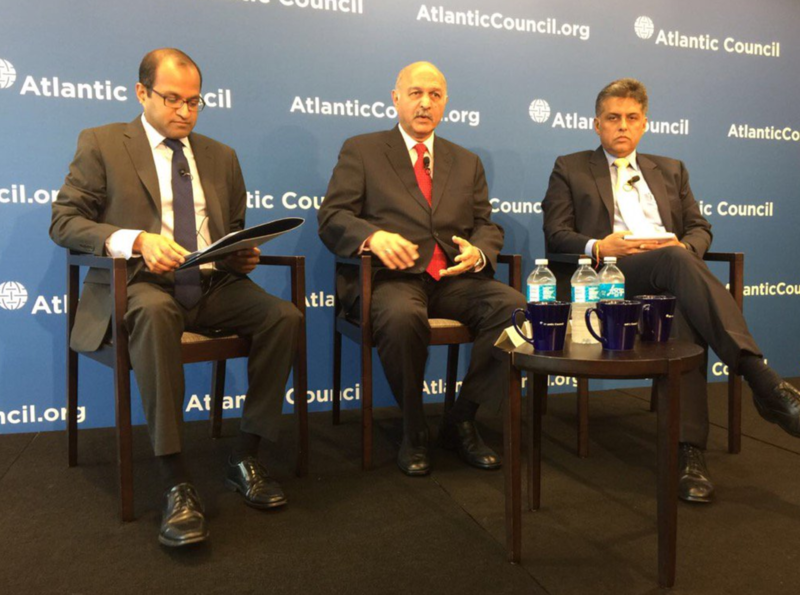 Above: (left to right) Moderator Bharath Gopalaswamy, Senator Mushahid Hussain, and Minister Manish Tewari. On Monday, July 24 2017 my fellow interns Dustin Ruhe, Simone Williams, and I attended, “Media Diplomacy: Challenging the Indo-Pak Narrative,” hosted by the Atlantic Council. 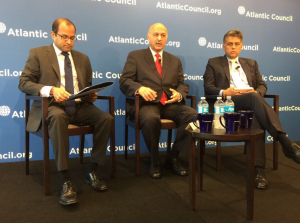 The talk centered around a moderated discussion between Mushahid Hussain, a prominent member of the Pakistani Senate as well as the former Minister of Information and Media Broadcasting for Pakistan and Manish Tewari, the former Minister of Information and Broadcasting for India. Hussain and Tewari offered their individual perspective about the state of media in their own countries and the role it plays in the relationship between the neighboring nation-states. The politicians both agreed that media has played a role in sparking tension between India and Pakistan and expressed that it is still important to, “maintain free and open media,” since it, “allows for the exchange of all ideas.”1 They further stressed that the government must be involved to allay tension. While I was keen to hear both speakers’ outlooks, I was especially interested in what Senator Hussain had to say. A key figure in the nation’s political scene, Hussain is deeply entrenched in the Pakistani establishment, so I expected his views and comments to reflect this cronyism. It was during the question and answer portion, when another attendee and I made inquiries about issues specific to Sindh that the Senator confirmed my assumptions. Sindh is actually home to thirteen CPEC backed projects, however several experts and officials have identified a number of faults that cast CPEC’s supposed benefits into doubt. One area of fault in particular is the negative environmental impact CPEC projects are projected to have on communities. Port Qasim and Thar Coal Block I & Mine Mouth Power Plants are two of the largest CPEC projects in Sindh, however scholar Michael Kugelman has expressed concern over such projects labeling them as, “emissions-belching technologies.”2 However, perhaps the greatest environmental threat posed by a CPEC project to Sindh is located more than 900 miles away in the Khyber Pakhtunkhwa province. The five-dam Indus Cascade could potentially, “stop the flow of silt – the lifeline of agriculture downstream – as well as drastically reduce the flow of water in the Indus, especially affecting downstream areas like Pakistan’s Sindh province.”2 While the exact the impacts are still unknown, researcher Hassaan Khan cites the consequences to the agriculture sector in places like Sindh could be significant. These ramifications would be grave for Sindh, as agricultural work accounts for nearly fifty percent of the province’s entire labor force.3 The Senator reasoned that the China-Pakistan Economic Corridor (CPEC) will create long-lasting prosperity to all of Pakistan, yet the potential risks posed by projects such as the Indus Cascade will only bring about hardship in Sindh. The Senator did not attempt to give a substantive answer to my question, instead he quipped that the Parliament of Pakistan has taken a, “strong position,” on the issue of forced conversions and that, “it’s the responsibility of both the federal government as well as the provincial government to ensure the protection of rights of all Pakistanis, including those who are not Muslim.”1 The legal actions that the provincial and federal governments have implemented have not improved the plight of the victims of forced conversions. In November 2016, the Sindh Criminal Law (Protection of Minorities) Bill was passed into law by the Sindh provincial government.4 The law makes it illegal to for anyone in Sindh to convert to another religion before the age of eighteen.5 Yet, the perpetrators of forced conversions taking place in Sindh have circumvented this measure by simply falsifying these girls’ birth certificates. Ultimately, the ineffectiveness of the Sindh Criminal Law (Protection of Minorities) Bill renders the Senator’s answer to my question hollow. These two incidents highlight a couple of key issues. Most obviously, the other member of the audience and I’s individual encounters confirm Senator Hussain’s consistency to prop-up the Pakistani establishment at all costs. More importantly it also shows how little attention he and the Pakistani government as a whole places on the well being of Sindh. This stance is not only disheartening it is also very troublesome. During the talk Senator Hussain revealed that a U.S. delegation is due to visit Pakistan in the coming weeks to discuss the former’s planned strategic overhaul for South Asia.6 Privy to such vital information, the Senator possesses the power to help direct the future of U.S. – Pakistan relations. Yet, his attitude exhibited during the discussion at the Atlantic Council indicates that the direction will not be to Sindh’s benefit, rather it will likely be to its detriment. In conclusion, while the focus of “Media Diplomacy: Challenging the Indo-Pak Narrative,” was between India and Pakistan’s media relationship, the stance maintained by speaker Senator Hussain revealed worrisome implications for Sindh. His refusal to address the issues raised by my fellow attendee and I in any real length and detail are further indication of suppression of access to information the Pakistani establishment exercises on smaller provinces like Sindh. This results in the human rights violations occurring in Sindh to be veiled to the international community. Challenging the Indo-Pak Narrative,” 24 July 2017, Atlantic Council South Asia Center, Washington, D.C. Moderated Discussion. Ebrahaim, Zofreen T. “CPEC and the Environment: Good, Bad or Ugly?” The Express Tribune, Lakson Group, 1 July 2017. Web. 1 August 2017. United States. Congressional Research Service. “Pakistan’s Sindh Province.” By K. Alan Kronstadt. Washington, D.C.: Library of Congress, 2015. Print. Qazi, Shereena. “Pakistan’s Sindh Province Outlaws Forced Conversions.” Al Jazeera, Al Jazeera Media Network, 25 Nov. 2016. Web. 1 August 2017. “Third Annual Sindhi American Youth Advocacy and Leadership Program Report for Congressional Offices.” Sindhi American Political Action Committee, 10 July 2017. Print. Iqbal, Anwar. “S. Asia policy: US team likely to visit Islamabad soon.” Editorial. Dawn [Karachi] 26 July 2017: n. pag. Dawn. Dawn Group of Newspapers, 26 July 2017. Web. 31 July 2017. Sindh Guardian Volume 6 Issue 1 Released.